Designed by Geerd Hendel STRING OF PEARLS was built in 1957 in Camden, Maine by Malcolm Brewer, the preeminent wooden boat builder of his time. Named PEARL NECKLACE, the 71 ft. yacht was a gift to the wife of the original owner who had requested a simple strand of pearls for her birthday. 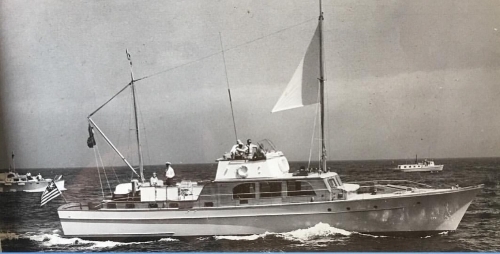 The owner drove PT boats in World War II so the yacht was equipped with four engines, built for speed, and he often raced his friend and neighbor Jack Kennedy's sport fisherman on Cape Cod Bay. The original owner sold his investment company to Warren Buffett and it later became Berkshire Hathaway. Built of mahogany and teak STRING OF PEARLS is 71 feet long,16 feet wide and weighs 40 tons, yet she can achieve 27 miles and hour. She is Coast Guard certified to carry 40 guests and subjected to routine safety inspections. Capt. Brian Quin bought the boat in 1985, restored it in Newport, Rhode Island and chartered throughout New England for 21 years. Numerous celebrities such as Bruce Springsteen, Brad Pitt, Pierce Brosnan, Harrison Ford, many statesman and a couple of princesses have enjoyed the boat over the years. In 2004 a five star resort on the Georgia coast invited the boat to an exclusive charter arrangement. Now, 14 years later she will move to Morningstar Marina and be available to charter St. Simons Island and the beautiful Golden Isles.